When we lived in Minnesota, our next door neighbors were Bill and Lois. They are still some of our dearest friends. Bill is really smart and very kind. He is also a character. One day, he decided he was going to cut down the tree at the corner of his house. He had it rigged so that it would fall out into his back yard, missing his garden, the garage, and all the other trees around. It was a good plan. But you know what they say about the best laid plans. I had just come home with the kids. We came out of the garage and started up the driveway and then stopped because Bill was taking a chain saw to a tree. We knew something exciting was about to happen. And it did. The tree fell, but instead of taking the preferred path down, it came out at an angle from the house, in a direct line with where my son, who was seven, was standing. I was not concerned, because I knew the tree was not tall enough to make it to the driveway, but he didn't. The tree fell, taking out their clothesline and ours, the ground shook, and Curtis burst into tears. Lois came out of the house and yelled at Bill for upsetting Curtis. 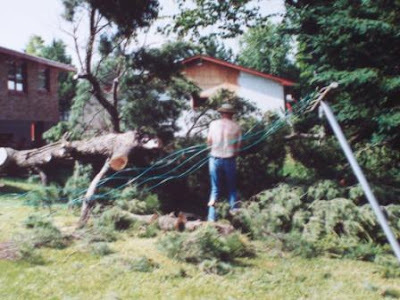 Bill got his chain saw, cut up the tree, and righted the clotheslines. So you can imagine my interest yesterday when hubby came home from Saturday breakfast with the boys to tell me that they were going over to one of the guys' house to cut down a tree. Where's my camera? Bill, you may want to take notes. Lots of ropes controlling the path of the limbs. The first of two big limbs coming down, spewing smaller limbs everywhere. Now that the second big limb is down, it's a matter of cutting it up and cutting the trunk down to a stump. When that was done, they loaded it onto a trailer using a crane. Then they hauled it to the dump, where it weighed in at 1540 pounds. I'm just glad no clotheslines were harmed in the cutting down of this tree. That reminds me of the time that Danny and a friend were trimming trees for extra money. They dropped a limb through the roof of the house next door to the one where the tree was. Needless to say, they made no extra money for that job, and it was the last time that they trimmed trees for anyone. di - Yeah, I can see where that would cut into the profits! My husband is pretty good about the ropes and such when he's cutting down a tree, but I still get nervous nonetheless. Only in Oklahoma can three men cutting down one tree become a ceremony. Actually I had heard that trees seldom grow tall enough there to cut down, before they get burned up or blown away in Tornado Alley. We have too many tall trees here to make a project out of a drop. Rental tools are for sissies. Real men just use a sharp saw, and are ready to run. I admit I did take down one tree and two clothes poles with one cut, when you were here. Don't forget, I missed both houses. Besides, I got distracted when I realized a pretty neighbor was watching! heather - Yeah, it's hard to know where it's going to go. That's why those tree removing companies can charge so much. I stood well back with a good zoom lens! bill - You did a good job. We just like to tell it because it is one of our Bill stories and we love our Bill stories. And you called me purdy! Are you sure Curtis wasn't crying because he saw Bill without a shirt? I cried a little now just looking at the picture. jeff - No, Bill was actually wearing a shirt when he was cutting down the tree. He only took his shirt off after Lois yelled at him. I think getting into hot water made him sweat! I do recall Lois getting a little upset just because I knocked down two clothes poles. Tell Curtis to be sweet because I was thinking of something for his wedding. How about a new Porshe? I hate to go to weddings because girls can't keep their hands off me. As a matter of fact, they can't stop kicking me either! We will be there, Lord willing. That is if you don't hit like the rest. bill - Well, there will be a lot of girls there, so watch out. That's awesome that you are coming, we can't wait to see you both! Ask Lois to give Jeff a great big hug for me at his release party tomorrow, that's exciting! Jeff is busy, I accept all the free hugs!